"Join us for some Star Wars Birthday fun"
Read through our Star Wars birthday party ideas - Princess Leia and incorporate the best birthday party ideas into your party. Check out our cool Star Wars birthday party ideas for invitations. Take a picture of your daughter in her Leia costume, then download a picture of Luca (or some other star wars character), from the net. Using a photo program (download this from the net), put your daughter's picture into the picture of Luca. Add birthday balloons besides their heads. Print out on 4X6 paper. Glue silver chartreuse card stock paper onto the other side of the picture (same size), write all the party information on that side (do this before gluing, with your computer). Put the pictures in silver invitation envelopes and mailed it. "Princess Liea invites "name" to join her in the most amazing and fun Galaxy Party of the year, which will be held at "address" at "time and date" to "time". To RSVP please call this number by "date". Please be dressed up for this occasion!" Your daughter should dress up as Princess Leia for her Star Wars birthday party. Buy or make a costume. All you need is a white tunic, black tights, knee high black boots, a gold cord (belt), and a braided hairpiece. For the children who are not dressed for the occasion give them each a tunic. Buy yards of cheap brown (boys), and white (girls) fabric. From that you can make 2 tunics, fold the fabric in half and then cut a V (enough for their heads) in the middle. Tie a gold cord around their waist like a belt. Voila every one will look like little Jedis! The main colours for this Star Wars birthday party are black, silver and dark blue. So hang lots of balloons and streamers in the theme colours. Hang paper stars and moons. Hang spray painted Styrofoam ball planets by string from the ceiling. To get a spacey look, wrap your furniture in tin foil. Make a giant Death star, cut and paint a star from a poster board. Get Star Wars Music playing in the back ground during the party. Use a black tablecloth and silver coloured plates, cups, etc. Decorate the table with confetti stars and have a Star Piñata as centrepiece. Also tie a silver or blue balloon behind every chair. When the kids arrive give out badges (cut beforehand out of construction paper). Provide the kids with glue, scissors, glitter, markers, crayons, magazine pictures, Star Wars stickers and glitter. Let them make their own Star Wars badges. We have a whole section dedicated to Star Wars birthday party games. Below are some few games and activities you can play at your Star Wars birthday party. But if you want more cool games then please click away to our Star Wars party games section. Do you know some one who can face paint? Or purchase a set of face paints and give each guest an alien look! Let all kids stand in a circle, with one kid in the middle, who is blindfolded. He/she has to touch the face of one of the kids in the circle and in 20 seconds try to guess who it is. Star Wars birthday party game similar to Musical Chairs, but played with Star Wars music. Invite the kids to blow bubbles and have a bubble battles with each other. Before the Star Wars birthday party hide small Star Wars items all over the party. Invite the kids to look for Star Wars toys or small treats wrap in aluminium foil. Star Wars birthday party game similar to Pin the tail on the Donkey. Finish the party off with a Princess Leia or Star Piñata. The kids love piñatas. We have lots of yummy Star Wars birthday party ideas for food and drinks, have a look below. Mini Sandwiches: Make mini cheese or peanut butter and jelly sandwiches. Star Sandwiches: Cut out star shape sandwiches with the help of a star cookie cutter. 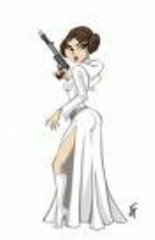 Princess Leia & Star Wars Cupcakes: Get some Princess Leia clipart and glue it onto toothpicks, let it dry. Afterwards, stick Princess Leia on the top of each cupcake! Or make your own chocolate cupcakes with black icing and put white icing stars on each cupcake, voila there you have space looking cupcakes. Star Cookies: Make star cookies with the help of a star cookie cutter. Frost the cookies blue or silver, to give a them a space look. Galaxy Red Juice: Make a red punch. To make this Star Wars birthday cake is very easy. Make or buy a cake, take a picture of Princess Leia, (from the net), and have a local bakery scan the scene onto the cake (like they do with photographs). When the shape is dry fill the icing, you can buy all the right colours in the icing shop. To make this Star Wars birthday party cake you need to make two chocolate bunt cakes. When done turn them upside down, freeze them, before carve them into the shape of a volcano, frost with chocolate. placed in the lava. While the lava is still hot pour it over the volcano, add some red sprinkles and put action figures of Princess Leia, Obi Wan ect. Get a McDonald's Happy Meal box and carefully open it (so you can trace the cut out on to poster board). Make the box and paint it silver or blue, make it to look like the galaxy. Decorate the box with stars and Princess Leia stickers. Write each guests name with silver glitter glue. Fill the boxes with Star Wars stickers, a Star Wars blower, and a star Wars pencil (e-bay), glow items, flashlights, glow-balls, lip gloss, and treats. Take a picture of each guest when they are done with their alien face paint. Include this picture with a thank you note. Use silver envelopes. I hope our Star Wars birthday party ideas will help you in your planning and I hope your princess will love and enjoy her Star Wars Party!